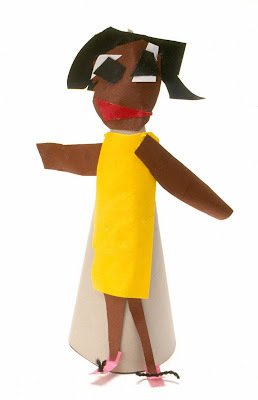 The children use construction paper and glue to create charming stand-up self-portraits. For ages 3 to 6. Plan 1 to 2 sessions. 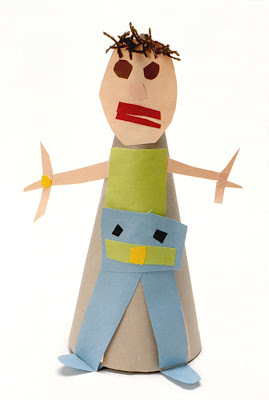 Make an 8-inch cone for each child using the light gray construction paper (see pattern below). Be sure that the cone sits securely on the table with no wobbling. Display the various colors of construction paper in the middle of each table. Cut skin-toned paper into 6- by 9-inch pieces and set aside. Set out the glue sticks and scissors. Set out optional yarn and mirror. Set out a scrap paper bin, if available. Explain to the children that when an artist makes a picture of a person, it is called a portrait. When the artist makes a picture of him or herself, it is called a self-portrait. 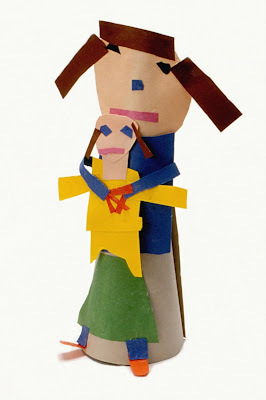 Tell the children that they will be making self-portraits with cut paper attached to cones to make them free-standing, or three-dimensional. To help the children become aware of the parts and proportions of their bodies, do some stretching exercises together. Have them reach into the air to feel how long their arms are; bend at the waist and touch their toes to feel how long their legs are; and wiggle their toes and fingers to become aware of their hands and feet. Have the children look into the mirror to observe their eyes, noses, mouths, the color of their hair, and any other unique characteristics. Demonstrate how to attach two pieces of paper by applying glue to the smaller paper, rubbing it smooth, and pressing it on to the larger paper. Sticky fingers can be wiped on the dampened sponge on their table. Demonstrate the proper use of scissors when cutting paper. Show the children that the thumb goes in the small hole, and two or three fingers go in the larger hole. With the blade of the scissors opened wide, place the paper deep into the opening, taking advantage of the whole blade when cutting. To cut a circle, or round shape, use one hand to slowly close the scissors, while using the other hand to gradually turn the paper. Continue opening and closing the scissors while slowly turning the paper until a circle is completed. 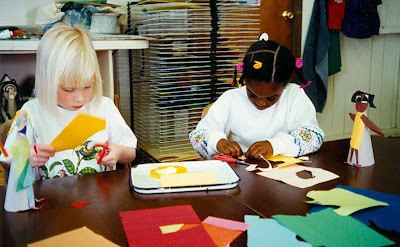 After the children choose a skin color and cut out their face shapes, they should use the glue sticks to attach them to the upper part of the cones. Have them cut out clothes, arms, legs, shoes, facial features, and whatever additions they choose from the colored papers on their tables. Explain that they can use either cut paper or yarn for their hair. Let the self-portraits dry overnight. Note: Children ages 3 to 4 usually need only one session to complete this project. 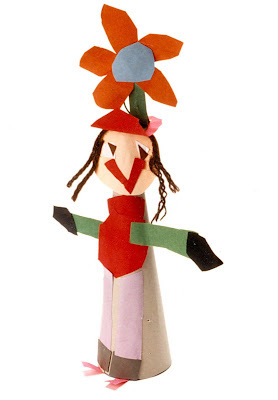 Since children ages 5 to 6 enjoy embellishing their figures, a second session will produce a great deal of added charm. Using the cones for support is a good introduction for small children to learn about three-dimensional form. Make the cones from a color of paper that will not overpower the self-portraits, and be sure that they sit firmly on the table. Children have a hard time cutting round circles. 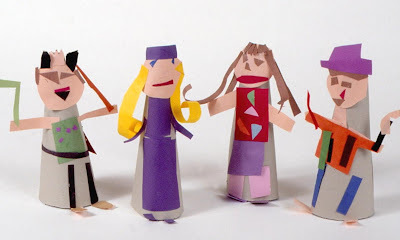 Have them practice coordinating the scissors and paper, but whatever shapes they achieve will be fun. Whenever glue is used, sticky hands result. Use only a slightly dampened sponge for wiping hands while working. Too much water will leave marks on the construction paper. The children enjoy having a mirror to refer to whenever doing self-portraits. As the self-portraits develop, encourage the children to add details cut from paper, such as buttons, pockets, hats, and belts. 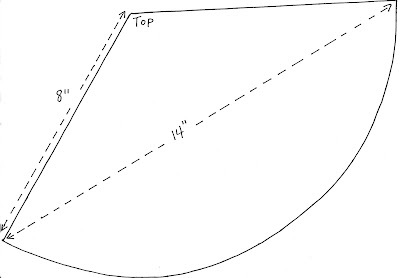 Below is a pattern for making an 8-inch cone using 9- by 12-inch construction paper. Overlap the two sides, leaving approximately a 2 1/2-inch opening at the bottom, and hold in place with tape. Let’s try to match each self-portrait to its artist. Discuss the characteristics that help us to identify each self-portrait. Ugh. My fingers are all sticky. I need to wash my hands. Everything fell off of my cone! He used up all the purple paper, and I want purple for my pants. There is no color of paper on the table that matches my dress. How can I make all the curls in my hair? My scissors must be broken. They won't cut the paper. Use the sponge on your table to wipe the glue from your fingers. Put a little more glue on your paper and smooth it carefully before attaching it to your cone. If a color gets used up at your table, let me know because I have more. You, as the artist, can decide which colors to use for your clothes. There are more colors of paper in the scrap paper bin. You are welcome to look through it if you need a special color. To make curls, roll paper strips tightly around a pencil, press, and pull the pencil out. To make your scissors work well, be sure you have your thumb in the small hole and your fingers in the larger hole.